Vicki Voisin - The Paralegal Mentor with Paralegal Career Strategies: The Paralegal Voice: Revitalizing Your Career with Continuing Education. The Paralegal Voice: Revitalizing Your Career with Continuing Education. Looking for new opportunities in the paralegal world? In this month’s episode of The Paralegal Voice we welcome Karen G. McGee, ACP, President of NALA and Christine E. Porter, ACP, Chair of NALA’s Continuing Education Council, to talk about opportunities through NALA and how you can revitalize your career with continuing education. The Paralegal Voice also thanks its sponsors: NALA…The Association of Paralegals and Legal Assistants, and Sun Trust. 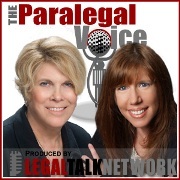 Please share the links to this episode of The Paralegal Voice with your friends and colleagues. If you have a request for a future show, or a question for us, you are welcome to contact us at TheParalegalVoice@gmail. Also, you can make sure that you never miss a podcast by subscribing to any Legal Talk Network program, including The Paralegal Voice, with RSS Feed Links or iTunes links at http://legaltalknetwork/rss-feeds/.